Located north of Dallas, TX, the City of Highland Village is an affluent community of 18,000 residents. Like most local governments, the city continuously aims to enhance public services, facilities and infrastructure while promoting fiscal responsibility. Because of this, the city has always been a bit ahead of the curve when it comes to adopting new technology. Recent initiatives to improve efficiency resulted in the Information Services Department’s reassessment of some processes, such as procurement, that were still paper-based and required manual data entry into multiple systems. Purchase orders were time consuming to document and it was hard to track compliance (like purchase and payment approvals). There were two options for digitizing procurement: using Incode document management software from Tyler Technologies to automate the storage of accounting records or integrating Incode with Laserfiche, which the city had been using for over eight years. The city chose the Laserfiche integration because of Laserfiche’s records management and searching capabilities that have been used throughout all city departments. This development was a team effort between the city and its reseller, DocuNav Solutions. Even better, purchase order processing which previously took four hours now takes between 30 and 45 minutes. 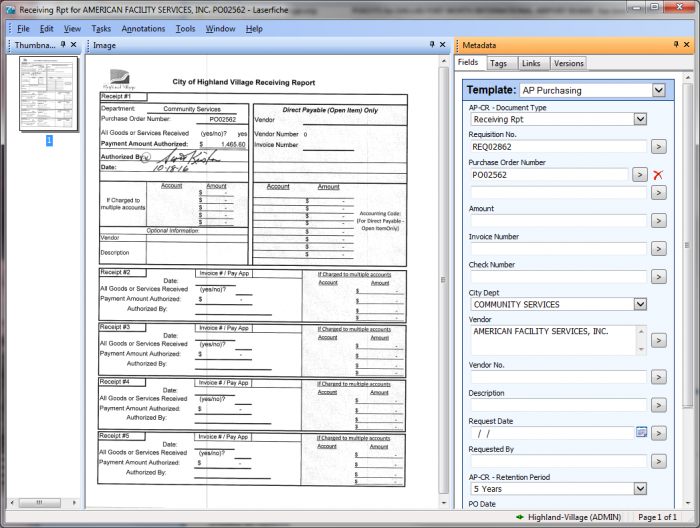 Here is how the City of Highland Village automated the monthly processing of 150-200 purchase orders with Laserfiche and an integration with Incode. 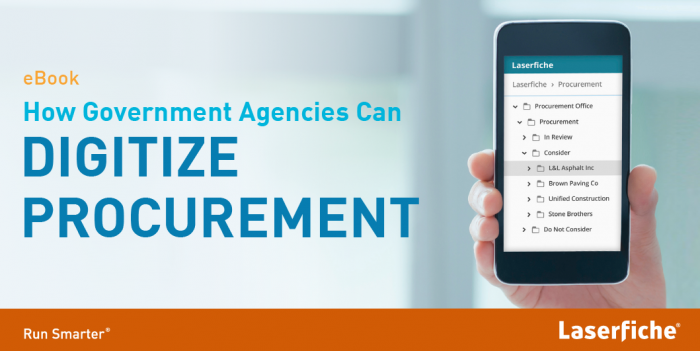 The process starts when a department puts together a quote package, scans it into Laserfiche and obtains management approvals in Incode. Next, the accounting department reviews and approves the quote in Incode and quote documents in Laserfiche. The accounting department then generates a purchase order, which is printed into Laserfiche with Laserfiche Snapshot. Laserfiche Workflow then emails a copy of this purchase order to the department administrator, who forwards it to the vendor. When a department member receives the requested goods or services, he fills out a receiving report along with any associated documents such as freight bills, packing lists, bills of lading or receipts, and scans the package into Laserfiche. Workflow routes the documents to the correct folder in Laserfiche and sends an email to the accounts payable department along with a link to the receiving documents. When the invoice is received, the accounting technician enters it into Incode and then scans it into Laserfiche. The accounting technician reviews both the invoice and receiving report in Laserfiche, and pays the invoice. Throughout the process, Laserfiche Workflow automatically renames the documents and routes them to the correct folders in the Laserfiche repository for archival retention. Laserfiche Workflow also pulls purchase order and invoice information directly from Incode, and uses it to populate Laserfiche metadata. The appropriate retention is automatically applied. If any database lookups fail, Workflow writes the error message into a metadata field for easier analysis and troubleshooting by the systems administrator. 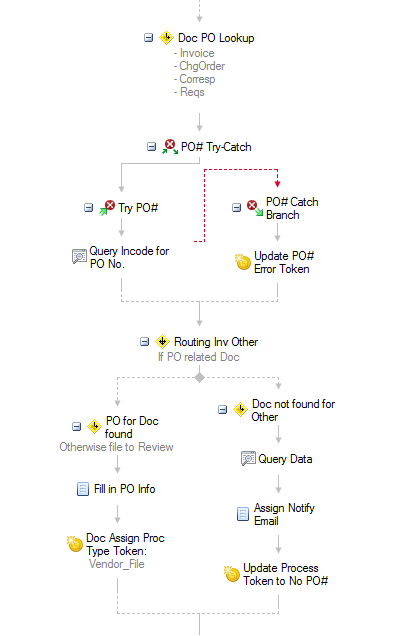 This workflow branch looks up the purchase order in Incode and assigns it to the document as metadata. If the lookup fails, the error code is saved in a different metadata field to help with troubleshooting. In order to simplify workflow maintenance and troubleshooting, the workflows are modular. 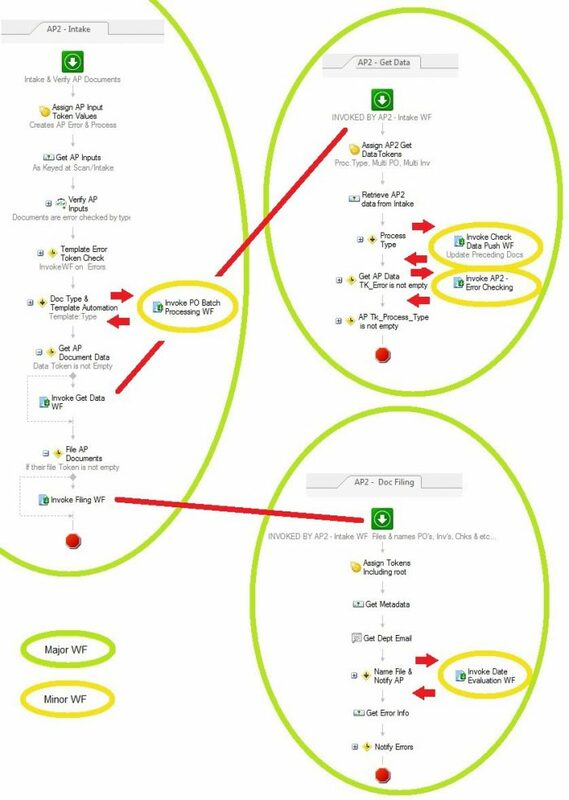 One workflow invokes different workflows for certain branches. An example of this is shown in the diagram below. This gives workflow designers the ability to reuse certain popular activities as building blocks in other workflows. The procurement process is designed with modular workflows.